the fragment is 12'' high and 16.25'' wide. This is a close-up detail of a fragment of a cross shaft, which is thought to be Anglo-Danish (no. 12 at Bakewell). This scene has figural sculpture and is thought to depict the Massacre of the Innocents, New Testament, Matt 2:16. On the left the legs and lower body of one figure survive. On the right there is a figure who is swaithed in a winding sheet except for his head. 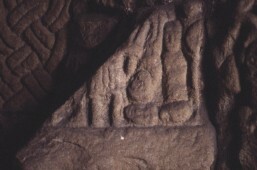 In between these two there is another figure also swaithed in a winding sheet, who is being held upside down.